Everything you ever wanted to know about shooting video in San Francisco. Prior to arriving in a new city, every producer needs the lay of the land. This guide explores everything about San Francisco, CA that producers need to know. San Francisco may only be about seven miles long, but it’s a city home to arts, culture, and beautiful Pacific ocean views. Almost 17 million people visit the Golden City each year, and for good reason. Some come for the entertainment of art galleries or one the many film festivals, some for the wide variety of food, and others just simply to enjoy the beautiful weather. One of the most iconic things about San Francisco is the Golden Gate Bridge. This bridge is a landmark for the city and attracts visitors from all over the world as one of the Seven Wonders of the Modern World. Its dark orange color is pretty abnormal for a bridge because it wasn’t supposed to be that color at all. The color is actually the color of the primer used to protect the steel, but architects loved the color more than any other options so it stuck. It may be odd but fits right at home with the artsy feel of the city. San Francisco has a lot of attractions other than the bridge as well. Take a boat to Alcatraz and visit the famous prison Al Capone was held in, or head to Chinatown to see a mecca of Asian culture in the largest Chinese community outside of Asia. There’s also Fisherman’s Wharf and Pier 39 which attract thousands of people a year for the restaurants, views, and shopping. Pier 39 is also home to hundreds of sea lions lounging on floating piers. Loud, but definitely a sight to see. For such a small city, it’s a big sports city with two NFL teams, the San Francisco 49ers and the Oakland Raiders, two MLB teams, the San Francisco Giants and the Oakland Athletics, NBA team the Golden State Warriors, NHL team the San Jose Sharks, and MLS team the San Jose Earthquakes. The city provides many opportunities for higher learning like the City College of San Francisco, University of San Francisco, San Francisco State University, and Golden Gate University. US News Travel lists some of the best hotels in San Francisco as the Ritz-Carlton, the Palace Hotel, the St. Regis, and the Inn Above Tide. There are also an abundance of chic boutique hotels locally owned if you wanted something a little more personal. Hotel Vertigo has great reviews and moderate pricing, Hotel Zetta has great reviews and is located only a couple minutes from the nearest BART station and cable-car station. Depending on the area you want to stay in, there are usually a variety of pricing options, although expect seaside views to be more expensive. If you want to be close to the San Francisco International Airport for easy flights, there are a number of options but they are not as inexpensive as most people expect airport hotels to be. For the most part, the Aloft, the Westin, and the Best Western are affordable options. San Francisco is broken down into many neighborhoods and areas defined by specific characteristics that make them unique. Fisherman’s Wharf is home to the Fisherman’s Wharf pier, North Beach houses a large Italian population and the best gelato, and the Central Market district has the headquarters of some major companies like Twitter and Spotify. There’s also Mission District, Union Square, Chinatown, the Financial District, SOMA, Castro, Hayes Valley, Haight-Ashbury, Japantown, and more. For a complete list of the neighborhoods in San Francisco, click HERE. Most of the neighborhoods are close by as San Francisco isn’t a very large city, so drive times tend to be relatively short. From most of these locations, distance to the airport can be 20-30 minutes via US-101. Leave some extra time to get around if you’re driving during rush hour. San Francisco is renowned for its great public transportation systems so no need to rely on a car unless you plan on going pretty far outside the city. There are buses, cable-cars, below and above ground Muni trains, BART (Bay Area Rapid Transit) trains, and boats. Buses and cable-cars are great for navigating within the city, and BART Trains and some Muni trains can take you to areas outside downtown and some neighboring counties. You can also take the BART to the airport for under $9 one way from any station. Prices for all of the modes of transportation range from just a few dollars to around $10. As with most cities now, there are also the options of a cab or ride-sharing apps like Uber. 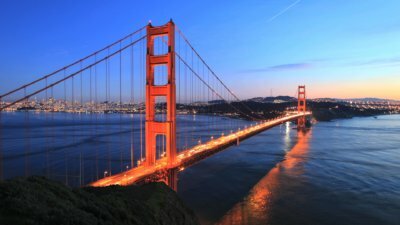 For more information on specific kinds of travel, check out the San Francisco Travel Page HERE. The weather is one of the greatest parts of the city. Hot breezy days can suddenly turn cool when the fog starts to roll in. Fog is a common occurrence in San Francisco so don’t be surprised when it’s sunny one minute and foggy the next. There are around 100 days of fog annually. Other than fog, expect a lot of sun. Wind from the bay and the Pacific Ocean can cool down most days, but it depends on what part of the city you’re in. The best advice we can give is to pack layers so no matter how often the weather changes during your stay, you’ll be prepared. For the current local weather forecast, click HERE. Crews across the country have a set of guidelines by which they conduct business. And as different as each city is from another, so are those guidelines. Every producer should have a basic understanding of each city’s standards. Shoots in San Francisco are based on a ten hour day and the crew is on the clock at the specified crew call. Overtime at a rate of time and a half begins after ten hours. If your shoot takes the crew to a distant location, travel time can be expected. A distant location is any location outside a circle with a 30-mile radius drawn around the city. But all of these are just guidelines; certainly, verify with your crew their specific policies. For any other questions you may have about San Francisco, be sure to check out their Chamber of Commerce and Visitors Center.